Adam Belknap (10) tackles an Ozen running back. Lions Win Nail Biter on Heroic Field Goal, LIVINGSTON, November 5, 2016 - While the Lions wont be playing in the post season, they played their last game and won in a dramatic fashion that left the team, coaches, and fans jumping in the air, hugging and reveling as if they had just won state. Yeah, it was that good. The Lions started strong when Quarterback Hunter Bland hit Receiver Christian Mitchell for a 58 yard catch and run touchdown, but the pesky Panthers wouldn't go away. Okay, so as the scoring summary above points out, this was a see-saw game. When the Lions had the ball on the Ozen 27 yard line with 15 seconds on the clock, I was thinking that they should try to get one more play off to get closer for a field goal. I honestly thought that a 44 yard field goal WITH THE GAME ON THE LINE was a bridge too far. Coach Broussard opted for the field goal attempt. For the kicker, Junior Raul Fernandez, he's not a big guy. He looks like he might weigh 120 lbs. dripping wet. For him to go out there and nail that kick (with room to spare) was nothing short of impressive. It was ice cold and totally BAD A**. Quarterbacks Hunter Bland and Cameron Merchant did a great job of leading the Lion Offense in a district where I still believe the Lions are a smaller school. Christian Mitchell (the Lions best offensive weapon) is a junior and it'll be exciting to watch his senior year unfold. Linebacker, Will Broussard will be back next year. Senior Defensive Lineman, Terry Carter had a great game. Senior Running Back, JD Green will be sorely missed. This game was great for several reasons. For starters, the Lions ended the season on a good note. No, they won't be in the post season, but the memory of this game will live in the minds of these youngsters for the rest of their lives. For the seniors, it was just a phenomenal way to wrap up their playing days for the Lions. No matter where these kids go in life from here, they'll always be able to look back on this night. Whether they're in the Army training in freezing snow, or in their first year of college, they can think back on this night and smile. Finally, I stand with Head Coach, Brian Broussard. No, the Lions didn't go to the playoffs, but Broussard has put together a football culture at Livingston that not only passes, but is able to defend the pass. He's put together an offensive system that's more complex and forces teams to respect the pass (which in turn opens up the running game and vice versa) and you can talk to Broussard without getting the feeling that he's about to blow up. I believe the Lions will be better next year. We're looking forward to covering them again. Christian Mitchell scored the first TD of the game on a 58 yard catch and run in the first 2 minutes of the game. Adam Belknap (10) and Aaron Stanley pressure the Ozen quarterback. Mitchell has a knack for making spectacular receptions. Aaron Stanley picks up yardage on a pass play. Big JD Green rumbles for Lion yardage. ...runs into the endzone for a Lion TD. Yes, that's number 17 AGAIN making another spectacular catch (after the catch he turned and ran in for a TD). Mitchell was a thorn in the side of the Ozen defense all night. Hunter Bland runs for yardage. Can Hunter Bland dunk a basketball? After seeing him leap over this tall Ozen defender, the question must be asked. 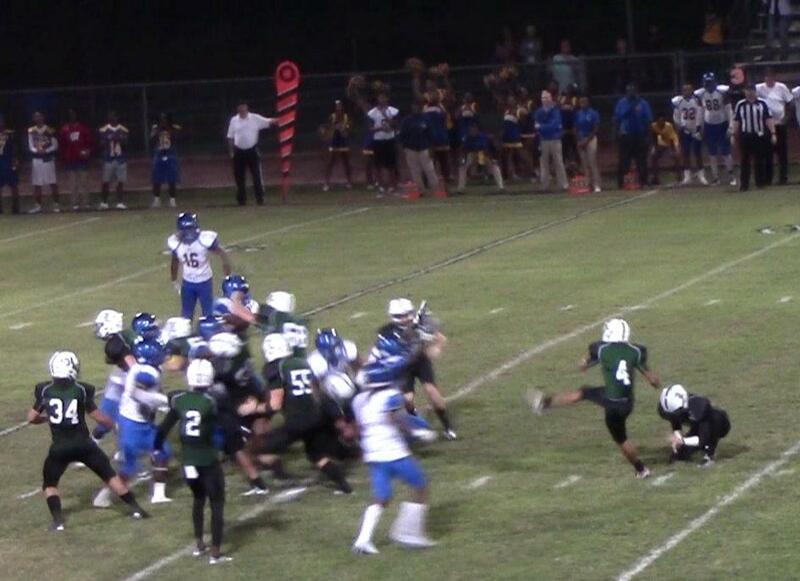 After Raul Fernandez DRILLED this dramatic 44 yard field goal for the game winner, the stadium erupted in celebration. Fernandez was the recipient of a celebratory baptism by Gatorade.